Pantovigar®/Pantogar® contains a unique, highly concentrated active substance complex which stops hair loss and increases the metabolic activity of the hair root. This stimulates the hair cells to divide and form new cells and the hair returns to the active growth phase. 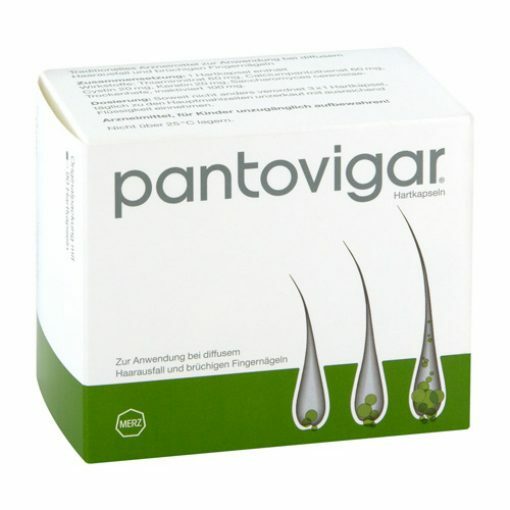 Pantovigar®/Pantogar® contains a unique, highly concentrated active substance complex which stops hair loss and increases the metabolic activity of the hair root. This stimulates the hair cells to divide and form new cells and the hair returns to the active growth phase. The effectiveness of Pantovigar®/Pantogar® against hair loss has been proven in numerous clinical studies. Physicians and pharmacists worldwide recommend Pantogar® as a dependable medical treatment for diffuse hair loss. Diffuse hair loss occurs because of a disruption in the hair growth cycle. If the hair root is not well nourished or is weakened through illness or stress, metabolic activity decreases, cell division declines and the growth phase of the hair is reduced. This leads to an imbalance between anagen hair (= growing hair) and telogen hair (= shedding hair) and more hair falls out than grows back. This is where Pantovigar®/Pantogar® comes in: Pantovigar®/Pantogar® contains a specifically formulated combination of active substances which reactivate the natural function of the hair root, stopping hair loss. Cell division is stimulated and the hair switches from the resting phase back to the active growth phase. Pantovigar was recommended to me by my hairdresser because I occasionally suffer from severe hair loss due to stress and illness. Since I only have very thin, fine hair anyway, a disaster. Already after 1 month I actually noticed a decrease in hair loss, after 2 months nothing was actually to be noticed at all (I took however additionally silica capsules). Now, after 3 months, I have the feeling that my hair has become even stronger. I didn’t feel any side effects. I can recommend Pantovigar without reservation!